After a night in Phoenix I drove east to the Boyce Thompson Arboretum in Superior for their opening at 8am. My target here would be RUFOUS-BACKED ROBIN, with several nice common birds also possible. 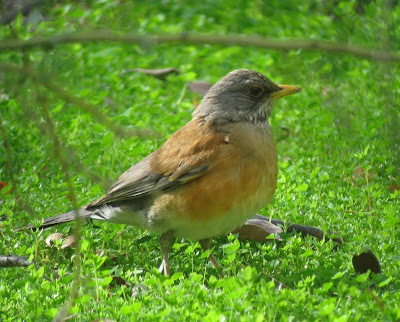 Two robins had been seen here sporadically throughout the winter. A third RBRO had been seen earlier in the winter in AZ, well south of Tucson, but that hadn't been reported for several weeks, so this was my one chance at this very rare but increasingly regular visitor from Mexico. I headed straight for their favorite hangout, near the Herb Garden, and it didn't take long for me to locate one of them. 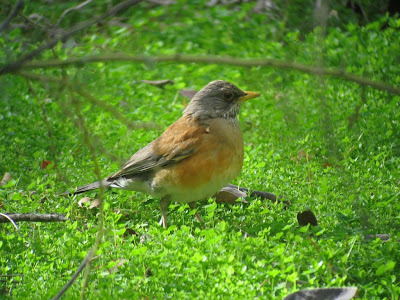 The Rufous-backed Robin (Turdus rufopalliatus) is a more surreptitious species than our closely related American Robin. When I first got on the bird, I actually flushed it from the path and it flew into a thick bush where it remained for a few minutes without so much as moving a feather. After a while though, the robin hopped onto the ground and even into the open to feed for brief periods. Since I was the only person around at the time, there was no commotion to make the bird feel unsafe. After happily watching it for a while, foot traffic began to increase at this popular park which caused the bird to spend more time within vegetation than out on the lawn. My scope views were quite good despite the light being less than perfect. I even managed a few photos. After the robin I continued the loop trail around the park, first running into a GILA WOODPECKER tending to its cavity in saguaro cactus, then a ROCK WREN sticking close to the ground. More ANNA'S HUMMINGBIRDS zipped overhead and I had a couple disappointingly quick looks at COSTA'S HUMMINGBIRD. The arboretum was quiet overall, but there were a few scattered birds and small flocks kicking around. One roving flock was comprised of LADDER-BACKED WOODPECKER, VERDIN, BLACK-TAILED GNATCATCHER, GREEN-TAILED TOWHEE, and BLACK-THROATED SPARROW. Not a bad mix of species for an easterner to see. Later, a mixed flock of juncos contained multiple OREGON and PINK-SIDED forms. Late in the morning it was time to head southwest toward Tucson, which would be my base for a few days. On the way I would scour the Santa Cruz Flats (mainly agricultural fields) for a few more target birds, most notably Ruddy Ground-Dove. Along Norma Road I had another BURROWING OWL and GREATER ROADRUNNER. The fields on Picacho Boulevard held 2 CRESTED CARACARA and a LOGGERHEAD SHRIKE. Scattered about were VESPER SPARROWS, WESTERN MEADOWLARKS, LARK SPARROWS, and my first LARK BUNTING of the trip. No ground-doves of any sort as I approached the cattle corrals at Red Rock. This particular location is one of the best-known for Ruddies (and other doves) in the state. It was immediately apparent that the place was teeming with doves and blackbirds. All the expected blackbirds were present: YELLOW-HEADED (about 250 of them), RED-WINGED, BREWER'S, GREAT-TAILED GRACKLE, and BROWN-HEADED COWBIRD. The doves were equally impressive, especially the numbers of MOURNING and EURASIAN COLLARED-DOVES. A few WHITE-WINGED DOVES were sprinkled in. The wind was really blowing now (luckily I was upwind of the heaping piles of cow manure). As I approached the water tank at the west end of the property, a ground-dove scooted under the fence. A few minutes of searching finally turned up a group of 3 RUDDY GROUND-DOVES taking shelter from the wind behind a fencepost. It was too windy to look for Bendire's Thrasher, which occur in the area, so I headed south into Tucson. A Short-tailed Hawk was spending its 3rd winter in northeast Tucson. I spent the last hour before sunset searching its favorite perches and neighborhoods without success. I would get a couple other shots at this bird though. Just wondering... did you just use your instincts in places you know would have birds? Or did you take tours? I love going to refuges/national parks/whatever and wondering on my own. When I go in May, and not just SoCal/AZ, I plan to call each states/stops/areas/whatever's Audubon and try to find hot spots... or at least a website. Funny Luke. I don't know what I was thinking either. The hot sun must have been getting to me. Hey Brian, I didn't take any tours. Other than one day of birding with a local friend (Jay Hand), I was on my own the whole time, including the planning aspect. I planned my itinerary by first observing the local listservs for a couple months, noting which places were getting a lot of birds. From there I consulted the two ABA/Lane birdfinding guides (SoCal and SE Arizona) for more good locations. Then I put together my route, which changed a little bit once I was out "in the field." There's a whole lotta info on the internet for you. Yea I got some listservs bookmarked, and other places planned out already. Luckily, I have from May 1st to July 16th to do the loop... so I can wonder and ramble. All road trips wind up with a few changes.